Esquires Coffee One Of The Top Thirty Stores In Ireland! 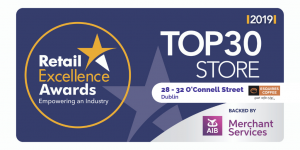 We’re thrilled to announce that our 28-32 O’Connell Street Dublin store has been announced as a Top 30 Store of the Year in the Retail Excellence AIBMS Awards! Retail Excellence is a not-for-profit company that supports Irish retailers to be the best they can be. It involves over 1,850 leading retail companies who operate in the Irish market so to receive this nomination is a great honour. We are extremely proud to have this recognition for our fabulous 28-32 O’Connell Street Dublin team. We are also extremely grateful to our loyal and friendly customers who have helped us get here! © 2018 Esquires Coffee. All rights reserved. Website design by: Rob&Paul.